Pattaya has hundreds of guesthouses that cater for anyone’s needs, taste and budget. If you don’t fancy spending your holidays in a large hotel, look for moderately-priced accommodation in a more personal environment, or just want to save the annoying “joiner fee” many larger hotels charge for taking “visitors” back to your room, then we hope this directory can help you find a nice room at the right price in the location of your choice. 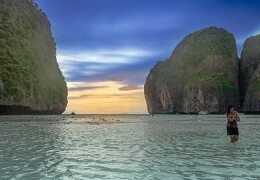 On this page, we’ve listed more than 100 guesthouses and budget hotels all over Pattaya and Jomtien. Please have a look around their websites to view location maps, pictures of rooms and facilities, or to book a room online. Please note that only guesthouses that operate their own websites and/or offer discount internet rates and can be booked online through our partner Agoda.com, have been listed here. We do not warrant the accuracy of room rates or other third-party information, which may have changed since we last accessed their websites. If you’re the owner of a guesthouse in Pattaya that is not listed here yet, or you want to recommend your favourite “home away from home”, please contact us to have it listed on this page for free. Our general guidelines are that a room in a guesthouse, as opposed to a hotel, should not cost more than roughly 1,000 Baht per night; a “guesthouse” should have a more familiar atmosphere than a large hotel and, last but not least, not charge a “joiner fee” for taking guests back to one’s room. To search for budget hotel rooms in Pattaya, please also check the website of our partner Agoda.com which offers an extensive selection of inexpensive guest rooms in Pattaya and anywhere else in Thailand or Asia. If you cannot find what you’ve come looking for here, Agoda has more than 1,000 hotels and guesthouses in Pattaya to choose from – all at discount internet rates starting at less than 400 Baht a night. Pleasant budget guesthouse near the popular Soi Buakhao nightlife district. Fan and air-con rooms with satellite/cable TV, in-room safe, fridge, free WiFi. Discount Internet Rates From Less Than 500 Baht! BOOK NOW! Rooms with living area, sofa, cable TV, flat screen TV, DVD, air-con, fan, safe box, free Wi-Fi etc. Popular apartment building in North Pattaya with 30 standard, superior and deluxe rooms. All rooms have air-conditioning, free WiFi, satellite/cable TV, in-room safe, fridge etc. Superior rooms include a kitchenette, deluxe rooms (40sqm) also have a separate seating area. Located in the heart of Soi Buakhao, this new and secure 54-bed backpacker's hostel has mixed dorms, female only dormitories and double rooms, all with air-conditioning and free WiFi. Regular rates from 280 Baht per night. Highly-rated small guesthouse with nine clean and tastefully furnished air-con rooms, all with satellite/cable TV, safety deposit box, fridge, free WiFi etc. Standard and superior rooms with aircon, cable TV, fridge, daily cleaning etc. Gay-owned guesthouse. Fully furnished air-con rooms with TV, private bathroom etc. Centrally located near the intersection of Pattaya 3rd Road and South Pattaya Road, this highly-rated and friendly guesthouse features eight clean air-con rooms, all with satellite/cable TV, fridge, free WiFi, balcony etc. Good value for money. Rooms with air-con, fan, hot water shower, safe deposit box, fridge, cable TV, DVD, free Wi-Fi etc. Monthly discount rates. German hotel and restaurant. Long-stay discounts, free WiFi. Excellent location in the heart of Pattaya's famous Soi LK Metro nightlife district. Air-con rooms with fan, cable/satellite TV, free Wi-Fi internet, fridge, telephone, in-room safe, bathroom, balcony etc. Monthly discount rates. Popular bar on the ground floor. Centrally located in South Pattaya, this small 47-room hotel is popular especially with Indian visitors and offers comfort and convenience at reasonable rates. All rooms have air conditioning, satellite/cable TV, in-room safe, seating area, fridge, free high-speed internet. Clean and friendly eight-room guesthouse with outdoor swimming pool. All rooms include satellite/cable TV, air conditioning, fridge, fan. Aircon rooms with cable TV, fridge, en-suite bathroom, free Wi-Fi internet connection. Monthly discount rates. British pub, restaurant & guesthouse conveniently located in the heart of Soi Buakhao. 15 air-con rooms with flat screen TV, DVD player, modern bathrooms, satellite TV. Air-con rooms with TV, fridge, ceiling fan, digital safe, internal telephone, maid service, no "guest fee". Monthly discounts available. Fully furnished air-con rooms with free Wi-Fi, electronic safe, TV, DVD, fridge, bathroom etc. No "joiner fee". Monthly discounts available. Standard and deluxe air-con rooms with fan, cable TV, safe box, bathroom, fridge etc. Bar and guesthouse in the heart of Pattaya's popular Soi LK Metro nightlife district. 12 air-con rooms with TV, fridge, safe, free WiFi access. Regular room rates from 520 baht a night. Long-stay discounts available. Dutch restaurant and guesthouse; clean air-con rooms with TV, fridge, room safe, daily room cleaning service. Restaurant and guesthouse with spacious and clean air-con rooms less than 100 metres from the beach. All rooms have cable TV, in-room safe, fridge, free WiFi access; some with balcony and separate dining area. Luxury gay guesthouse with suites from 30 to 100m². Free Wi-Fi, kitchenette, bathroom, cable TV, DVD, balcony, room safe, air-con etc. Air-con rooms with cable TV, private safe, fridge, free ADSL internet. Swiss-owned guesthouse in popular gay entertainment area. Rooms with air-con, fan, cable TV, safe, fridge, balcony etc. Friendly family-run establishment conveniently located in the heart of Soi Buakhao. Standard and superior rooms with air-con, TV, safe, free WiFi etc. German-managed apartment house. Air-con rooms with free Wi-Fi, television, balcony etc. VIP rooms (50 m²) also available. Restaurant and guesthouse less than 100 metres from the beach. All rooms have free Wi-Fi Internet access, safe, cable TV, ceiling fan, air conditioning etc. Regular room rates from 1,000 Baht a night. You can save a lot by booking online. 12 fully-furnished rooms (42 sqm) with air-conditioning, cable TV, fridge, free WiFi etc. Facilities include a private swimming pool and CCTV. Popular eight-room budget guesthouse and restaurant. All rooms have air conditioning, cable TV, washing machine, fridge, free WiFi etc. Triple and family rooms also available. Newly renovated rooms, all with air-con, fan, cable TV, fridge, balcony (seaview), bathroom. Low season discounts. Located less than 100 metres from the beach, this small 24-room hotel features air-con rooms with satellite/cable TV, DVD/CD player, in-room safe, free WiFi etc. Spacious air-con rooms with safety box, cable TV, fridge, free Wi-Fi. Monthly discounts available. Air-con rooms with cable TV, free Wi-Fi, fridge, in-room safe, minibar etc. 16 serviced apartments in the centre of South Pattaya, all with air-conditioning, satellite/cable TV, fridge, free WiFi etc. Friendly family-run 10-room guesthouse. All rooms include air conditioning, cable TV, in-room safe, fridge, free WiFi. Deluxe rooms even come with a kitchenette and sofa bed. Rates include breakfast. Located above the famous Happy Home Thai cooking school and a new restaurant, the guesthouse offers air-conditioned single and double rooms, free Wi-Fi, a large common area with lounge, minibar and dining space. Monthly rates available. Belgian restaurant & guesthouse. Air-con rooms with free Wi-Fi, private safe, TV, DVD, balcony etc. Opened only in July 2015, the Hideaway is situated just off Soi Buakhow, in close proximity to all of Pattaya’s famous nightlife areas. The Hideaway has modern, fully equipped air-con rooms, with True Vision satellite TV on 40″ Smart TVs, fridge, coffee making facilities, balcony with chairs and table. Free WiFi and no joiner fee. Moderately-priced studios and one-bedroom apartments just 100 metres from the beach. All rooms have air conditioning, satellite/cable TV, microwave, fridge, free WiFi etc. Five beautifully appointed guest rooms with air-conditioning, TV, fridge, WiFi access. Conveniently located in the heart of Pattaya's famous Soi LK Metro nightlife district. Luxury studios and apartments with living room, kitchen, fridge, safe, super fast Internet, large TV, DVD player etc. Popular bar and restaurant on the ground floor with all live sports on TV all day, every day. Located near Soi Buakhao and Soi LK Metro, this clean and friendly guesthouse features seven comfortable air-con rooms with satellite/cable TV, fridge, WiFi access etc. Large rooms and small studios with air-con, cable TV, Wi-Fi, security card access etc. Situated just across the road from the beach and along the main taxi route to Pattaya, this popular restaurant and small hotel features 24 air-con rooms with satellite/cable TV, in-room safe, fridge, free WiFi etc. ; some with balcony and sea view. Regular room rates start from 1,000 baht a night; you can save a lot by booking online. Standard, superior and deluxe rooms with air-conditioning, cable TV, fridge etc. Popular six-room guesthouse just 100 metres from Jomtien Beach. All rooms have air conditioning, satellite/cable TV, in-room safe, fridge, free WiFi access, seating and dining area. Located just a stone's throw from Jomtien beach in a calm side-street, this small hotel features 22 large air-con rooms, all with cable TV, free WiFi, fridge, private balcony, dining table, sofa etc. Regular room rates from 950 Baht per night (low season). German guesthouse. Rooms with air-con, fridge, cable TV, free Wi-Fi, safe etc. Conveniently located near the southern end of Soi Buakhao, this guesthouse also features a pub/lounge and restaurant. Air-con rooms with satellite/cable TV, free WiFi access, fridge, minibar etc. Conveniently located in the heart of Soi Buakhao, this five-storey building has 23 luxurious guest rooms. Located in the heart of Soi Buakhao, this small hotel features 38 comfortable air-con rooms with satellite/cable TV, in-room safe, fridge, free WiFi. Air-con rooms with cable TV, DVD, fridge, safety box, bath tub, large balcony etc. Pleasant budget guesthouse in the heart of Pattaya's Soi Diana nightlife district. Fan and air-con rooms with fridge, TV, safe, free WiFi. Great budget hotel and popular restaurant conveniently located at the southern end of Soi Buakhao, just 10 minutes from Walking Street and Pattaya beach. Standard, deluxe and superior rooms with daily and monthly rates starting as low as 400 baht per night. 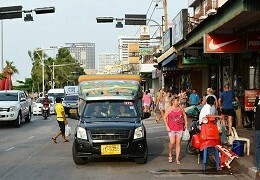 Popular bar, restaurant and guesthouse situated just 100 metres from Jomtien beach and the main taxi route to Pattaya. Clean, comfortable and affordable rooms with air-conditioning, satellite TV, safety box, fridge and free WiFi. Regular room rates from 800 Baht per night (low season). 14 tastefully furnished air-con bedrooms with TV, in-room safe, fridge, free WiFi. Three European-managed guesthouses in three equally popular locations - Soi Buakhao, Soi Honey & Pratamnak hill. All rooms have air-conditioning, minibar, room safe, TV and DVD. Free computer and internet access. 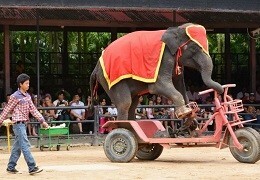 Experience life in a Thai village just outside of Pattaya! Budget rooms, apartments, bungalows with ADSL Internet, air-con, fan, fridge, hot water shower, TV, DVD, safe. Conveniently located in the heart of Pattaya's famous Soi LK Metro nightlife district. Air-con rooms with free Wi-Fi internet, cable TV, DVD, fan, fridge, safe, balcony etc. Maid service, no "joiner fee". Highly-rated yet moderately-priced guesthouse less than 100 metres from the beach. Standard, superior and deluxe rooms with air conditioning, fan, cable TV, in-room safe, kitchenette, fridge, free WiFi etc. Centrally located in the heart of Jomtien, only 30 meters from the beach. Clean rooms with air-con, hot water, cable TV and a safe in each room. Long-established and popular 34-room budget hotel at the southern end of Pattaya and along the main taxi route to Jomtien beach. The cozy, quiet and spacious rooms all comprise furnished living areas and are fully equipped with air conditioning, TV, refrigerator, personal safe, and balcony. Free WiFi access in all rooms. While the regular rates are a bargain, you can save a bit more by booking online. Conveniently located in the heart of Pattaya's famous Soi LK Metro nightlife district. Air-con rooms with cable TV, fridge, in-room safe, free WiFi internet etc. Bright and quiet air-con rooms with fridge, cable TV, DVD, safe, large bathroom, free Wi-Fi, no "joiner fee". Conveniently located in the heart of Pattaya's popular Soi Buakhao and Soi LK Metro nightlife district, this well-managed small guesthouse has air-con rooms with satellite/cable TV, DVD/CD player, in-room safe, fridge, free WiFi access etc. Conveniently located in the heart of Soi Buakhao. 11 quality rooms with bathrooms, satellite TV, safety box, air-con etc. Swimming pool access for guests. Conveniently located right in the heart of the bustling nightlife of Soi Buakhao, Soi Diana and Soi LK Metro. 36 inviting air-con rooms with satellite/cable TV, fan, fridge, free WiFi etc. Clean and friendly guesthouse in the heart of Pattaya with fan and air-con rooms. All rooms have TV and free WiFi. Dutch-owned restaurant and guesthouse just a stone's throw from the beach. All rooms have fan, air-con, TV, DVD, fridge etc. Gay-run guesthouse centrally located in Jomtien. Luxurious air-con rooms with free Wi-Fi. Well-positioned in South Pattaya, this popular apartment building features 36 air-con rooms with satellite/cable TV, safety box, fridge, free WiFi access. Popular restaurant, bar and guesthouse just 100 metres from the beach. All rooms have air-conditioning, fans, cable TV, king size beds, fridge, digital safe, free WiFi internet and daily room servicing. 20 CCTV cameras and a separate entrance to the rooms assure the privacy and security of guests. Popular nine-room guesthouse in the heart of Jomtien. All rooms feature air conditioning, satellite/cable TV, fan, fridge, WiFi access etc. Suites even come with a kitchenette and sofa area. Budget guesthouse near the southern end of Soi Buakhao. 30 air-conditioned rooms with satellite/cable TV, free WiFi. French hotel, restaurant & bar. Air-con rooms with cable TV, safety box, free WiFi etc. Long-stay discounts available. Just a stone's throw from Pattaya beach and just five minutes from Walking Street, this conveniently located guesthouse features 20 bright air-con rooms with cable TV and safety box. Located next to the bustling nightlife of Soi Buakhao, this guesthouse features 24 rooms with air conditioning, satellite/cable TV, free WiFi etc. British pub & restaurant in the heart of Pattaya's famous Soi 7 nightlife district, just a stone's throw from Pattaya beach. Tastefully decorated rooms with air-con, fridge, safe, TV with English language channels. 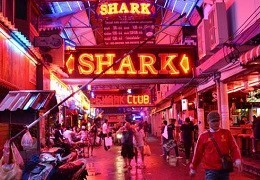 Centrally located in the heart of Pattaya's famous Soi 7 nightlife district, just a stone's throw from Pattaya beach. Air-con rooms with hot water shower, fan, cable TV, fridge, free Wi-Fi, safe. No "guest fees" for visitors to your room. Conveniently located in the heart of Soi Buakhao. Newly refurbished air-con rooms with cable TV, fridge, safety box, free WiFi. Popular "ladyboy" bar on the ground floor. British pub, restaurant & guesthouse conveniently located in the heart of Soi 6 and just a stone's throw from Pattaya beach. Standard, superior and deluxe rooms with air-con, digital safe, cable TV, DVD, bathroom, free Wi-Fi access, fridge etc. French restaurant, bar, hotel. Air-con rooms with bathroom, TV, minibar. Located in Soi Diana, next to the pulsating nightlife of Soi Buakhao and the highly rated go-go bars of LK Metro, this popular British-managed restaurant and guesthouse has 19 comfortable and spotlessly clean air-con rooms with cable TV, fridge, free WiFi etc. Regular room rates from 625 Baht per night. Special rates are available for long-term stay. Popular bar in the middle of the Soi LK Metro nightlife district and dozens of GoGo bars; six air-con rooms with satellite/cable TV, DVD/CD player, in-room safe, fridge, free WiFi access etc. 29-room budget guesthouse with spacious 35 sqm rooms. All rooms have air-conditioning, satellite/cable TV, WiFi access. Australian bar with guest rooms. Air-con, satellite TV, fridge etc. Quality air-con rooms with free ADSL internet, cable TV, DVD, safe, fridge etc. Air-con rooms with fridge, digital safe, cable TV, DVD, ceiling fan free Wi-Fi. No "joiner fee". Serviced apartments only 50 metres from Walking Street. All rooms have air-con, fan, safety box, free WiFi, flat screen TV, DVD, fridge, microwave etc. Air-con rooms 18-50m², cable TV, hot water shower, free Wi-Fi internet etc. Boutique hotel in the center of Walking Street. Quality rooms with air-con, free Wi-Fi, electronic safe, minibar, cable TV, granite bathroom etc. Small 30-room hotel conveniently located along the main taxi route between South Pattaya and Jomtien. Air-con rooms with satellite/cable TV, fridge, free WiFi. Air-con and fan rooms with hot water, cable TV, fridge, safe. Centrally located in the heart of South Pattaya, just minutes from the beach, shopping malls and nightlife districts, this 45-room guesthouse targets visitors on a moderate budget. All rooms have air conditioning, fridge, mini bar, cable TV, free high-speed internet. Regular room rates from 625 Baht per night (low season). English bar and guesthouse in the heart of Jomtien and just 100 metres from the beach. All rooms are fitted with air conditioning, fridge, cable TV, DVD, safe. Popular 12-room guesthouse in the heart of Pattaya's Soi Buakhao nightlife district. Fully furnished air-con rooms and apartments with free Wi-Fi internet, fridge, safe, cable TV. Some with balcony, kitchenette. Located in the heart of Soi Buakhao, Sutus Court offers spacious and stylish air-con rooms, all with TV, fridge, safety box, WiFi access, and private balconies. Regular rates from 550 Baht/night (low season). British bar and restaurant in the heart of Soi Buakhao. Eight large air-con rooms with satellite TV, DVD, safe, fridge, Wi-Fi etc. Free access to a swimming pool. Standard, superior and deluxe rooms with air-con, cable TV, telephone, minibar, safe etc. Comfortable air-con rooms with fan, fridge, cable TV, hot water etc. Located just five minutes from Jomtien beach, this small hotel features an outdoor swimming pool and has 30 air-con rooms with satellite/cable TV, in-room safe, fridge, free WiFi etc. 30 air-conditioned rooms with free WiFi, satellite/cable TV, in-room safe, fridge etc. Outdoor swimming pool. Situated just a stone's throw from Jomtien Beach; air-conditioned rooms with TV, fridge, internet access, in-room safe etc. Conveniently located at the southern end of Soi Buakhao. Standard, superior and deluxe rooms with air-con, telephone, cable TV, fridge, balcony etc. Popular budget guesthouse just a stone's throw from Jomtien beach. Large rooms (60 sq.m. ), all with air-conditioning, satellite/cable TV, fridge, free WiFi access etc. 22 nice fully furnished rooms with cable TV (international channels), fridge, water heater, free hi-speed internet, cleaning service etc. Air-con and fan rooms available. Long-established apartment with fairly cheap rooms in a central location on Soi Buakhao. All 60 rooms include air-conditioning, satellite/cable TV, fridge, free WiFi access. Budget accommodation close to where all the action is. Fully furnished air-con rooms with free Wi-Fi, bathroom, TV, fridge, balcony, daily cleaning. Just around the corner from Soi Buakhao and the GoGo bars of Soi LK Metro, this conveniently located guesthouse has 24 air-con rooms with satellite/cable TV, in-room safe, fridge, free WiFi etc. Located in the heart of Jomtien's gay nightlife district and not far from Dongtan beach, this gay-owned and managed hotel has 14 luxurious guest rooms, all with air conditioning, in-room safe, mini bar, satellite/cable TV, fridge, free WiFi. The Venue also has a private swimming pool for guests, a popular cabaret show bar, elevator, laundry service etc. Swedish bar, restaurant & guesthouse right on Jomtien Beach Road. Luxurious air-con rooms with cable TV, Wi-Fi, safe etc. Air-con rooms with cable TV, minibar etc. Long-stay discounts. Popular guesthouse just across the road from Jomtien beach. Air conditioned rooms with cable TV; some with balcony. Free WiFi in public areas. Aussie bar, restaurant & guesthouse, literally just a stone's throw from the beach and along the main taxi route to Pattaya. All rooms have air conditioning, fan, cable TV, free WiFi. Some have a large balcony and sea view. Can you add our Guest House ? Do we write our own comment etc ? Hi Andy, you’re welcome to write an own short description that I may edit. The Hideaway opened in July 2015. Situated in Soi Buakhow 15, in close proximity to all of Pattaya’s famous nightlife. Hideaway rooms are modern, fully equipped rooms, with True Vision TV on 40″ Smart TVs, Air conditioned, Refrigerator, Coffee making, balcony with chairs and table. 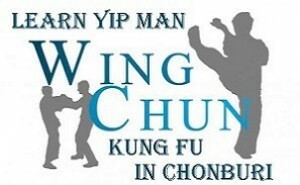 Check the website for promotions, and reserve direct via email. Mostly single occupancy strict non smoker and non drinker! Hi Firoz, just search for your preferred location in the directory above and I’m sure you’ll find a decent room at the right price. All rooms listed here are less than 1,000 Baht a night, many just 500 or 600 Baht. To find anything even cheaper than that will be hard though. 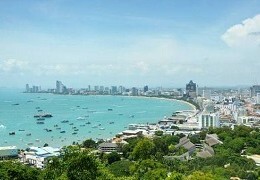 I´m Ram and like to visit Pattaya . My friends say there are many Girls for fun. How much they charge for one or 2 nights?? and where you can fix for me. You fix it yourself in the bars mate 😉 A night should cost you anything between 1,000 and 5,000 Baht all-inclusive. More details on our special bar girls pages. Alternatively, if you don’t like to visit bars, you should try dating sites or apps like ThaiFriendly.com. Good luck!